Simple to use yet powerful enough for thousands of small businesses! • Any number of names and addresses can be added and it's simple and straightforward. • City and state are automatically filled in when a zip is entered. 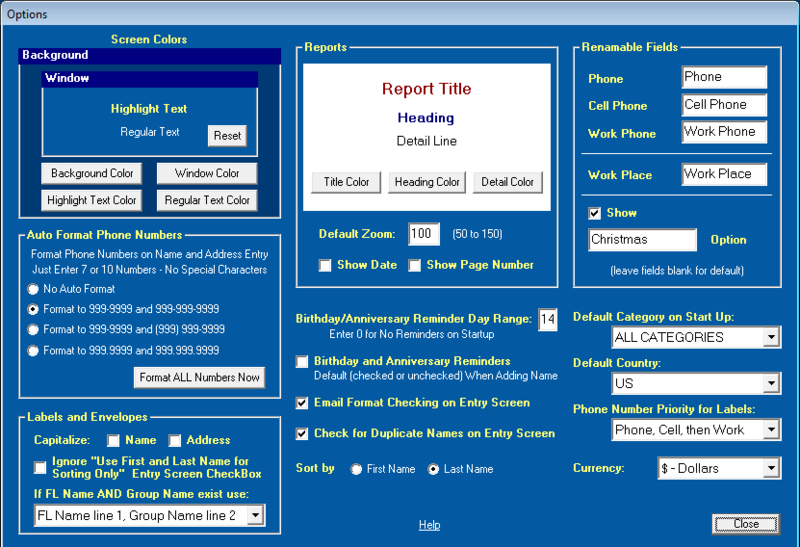 • Phone numbers are auto formatted based on a format selected by the user. • Pictures can be added to the address book and viewed in the picture gallery. • There are three different printable address books formats and a phone book. 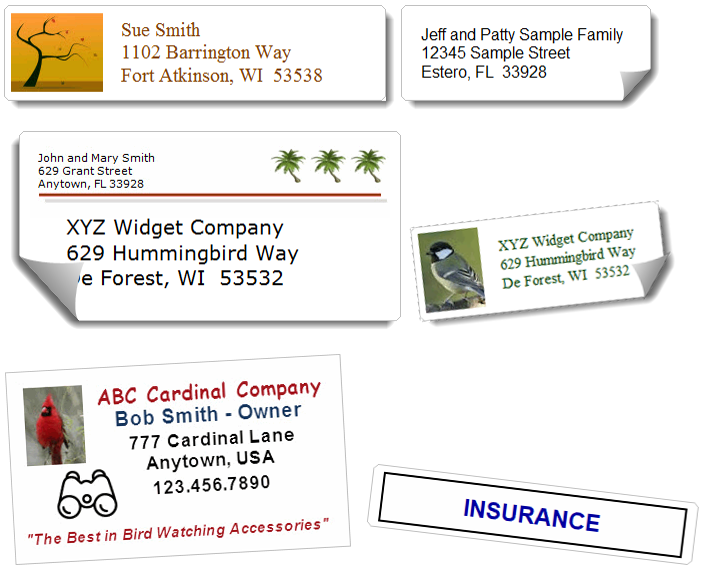 • Name and address labels can be printed on common label forms with pictures and clip art. • You can print on any size envelope (for most printers) and include a return address. • You can print file folder labels and 2" x 3-1/2" business cards. • There are birthday and anniversary reminders, a printable calendar, and a printable report. • There's a Christmas function to easily select names for labels, envelopes, and email lists. • Phone, Cell Phone, Work Phone, and Work Place can be renamed. • Other functions include daily reminders, a reminder calendar, an encrypted lockbox for saving sensitive information, Google and MapQuest address mapping, and much more. • Customize the program to only show the features you want. • More than one database can be added so you can have one for home and one for business. • Names and addresses can be imported from programs (including Parsons) that can export to a CSV file (comma separated values or comma delimited) or tab delimited file. • Install EZ on up to 3 of your computers. All printable reports can be exported. There are many export formats including the Adobe Acrobat Format (PDF). We recommend the PDF format. If you install Dropbox (Free up to 2 GB) on your computers and smart devices (iPhone, iPad, Kindle, NOOK, etc. ), you can export a PDF EZ Address Book Report to your Dropbox folder and names, addresses, and phone numbers will immediately be	available to your other computers and smart devices. Orders are shipped the same day received or the following business day. The Full Version is immediately available for download after ordering. OVERVIEW - EZ Home and Office is easy to use address book software for home and business. Any number of names and categories can be added and adding a name is simple and straightforward. The city and state are automatically filled in when a zip is entered and phone numbers are auto formatted. Pictures can be added to the address book and viewed in the picture gallery. There are three different printable address books including a 5-1/2" x 8-1/2" format. A phone book can also be printed. Name and address labels can be printed using many common label forms and pictures and clip art can be added. You can print on any size envelope. You can also print file folder labels and business cards. There are birthday and anniversary reminders when the program starts and a printable birthday and anniversary calendar. There's a function to easily select names for labels, envelopes, and email lists for Christmas or other special occasions. Other functions include daily reminders, a reminder calendar, Google and MapQuest address mapping, a recipe organizer with pictures, a budget maker, and saving sensitive information in an encrypted lockbox. 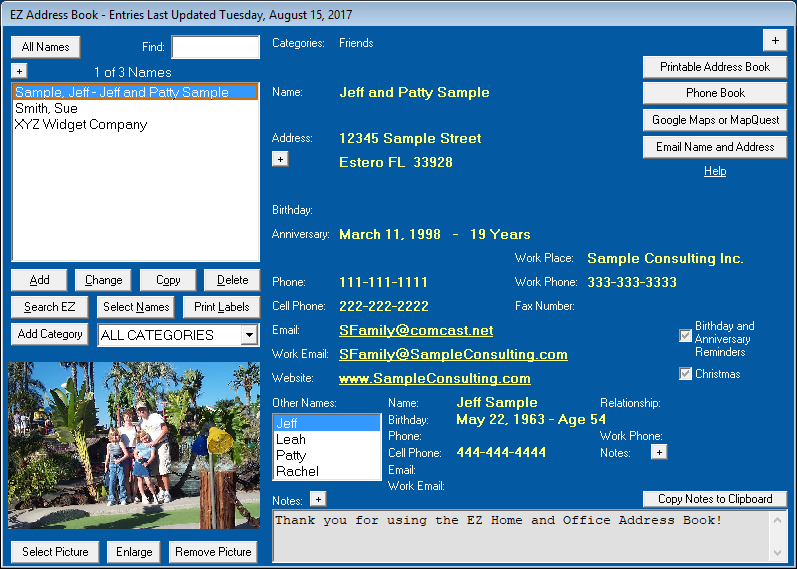 You can even customize the program to only show the features you want. More than one database can be added so you can have one for home and one for business. Names and addresses can be imported from programs, including Parsons, that can export to a CSV or tab delimited file. It's easy to print labels like the ones below. Sample graphics are included with EZ! 5160, 8160 Label (30/Sheet) 1" x 2-5/8"
5161, 8161 Label (20/Sheet) 1" x 4"
5162, 8162 Label (14/Sheet) 1-1/3" x 4"
5163, 8163 Label (10/Sheet) 2" x 4"
5164, 8164 Label (6/Sheet) 3-1/3" x 4"
Other label forms will work if they match the label dimensions and layout of the label sheets. Sample clipart and pictures are included with EZ including Christmas trees! 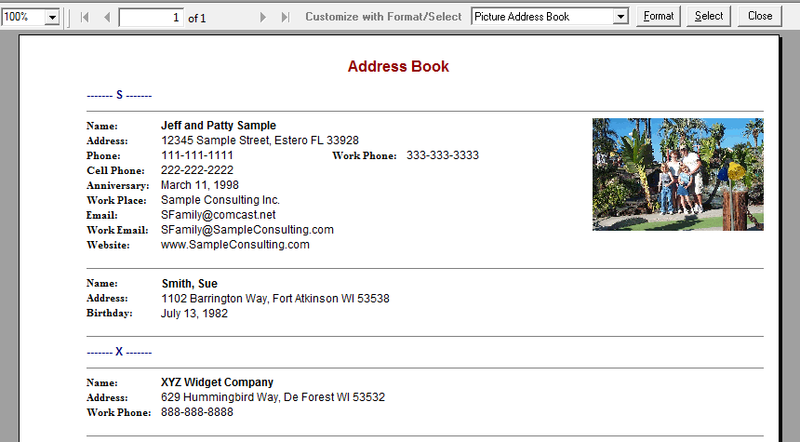 Picture Address Book - All fields from the EZ Address Book can be displayed including a picture. There are 3 different picture sizes that can be displayed (click the 'Select' button). Select Fields Address Book - All fields in the EZ Address Book can be displayed except pictures. Select the fields you want on the report (click the 'Select' button). 5-1/2 x 8-1/2 Address Book - This address book format displays and prints two 5-1/2 x 8-1/2 pages per sheet (perforated paper for this format can be bought on Amazon). The name, address, phone numbers, and email address are displayed. Only one email address is displayed and 'Email' takes precedence over 'Work Email'. 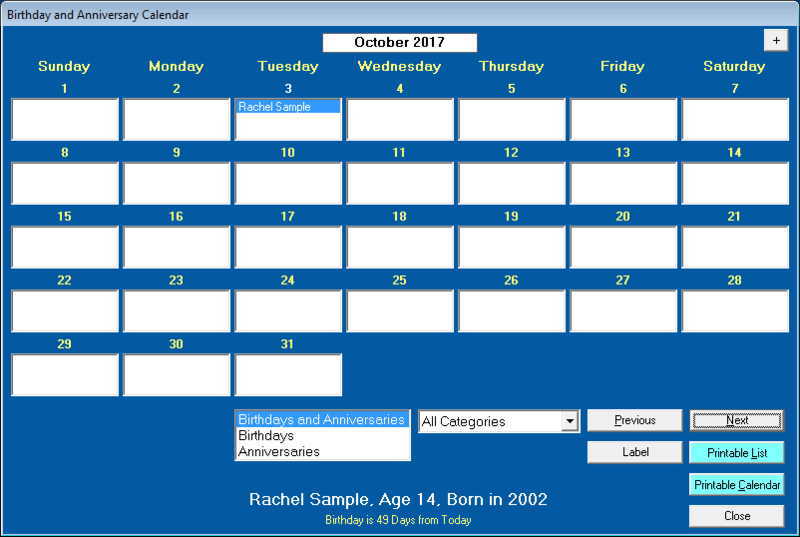 When the program starts, the Birthday and Anniversary Reminders Screen is displayed if any birthdays or anniversaries are within the Day Range set in Options. If the Day Range set in Options is zero, the reminders screen will not be displayed. 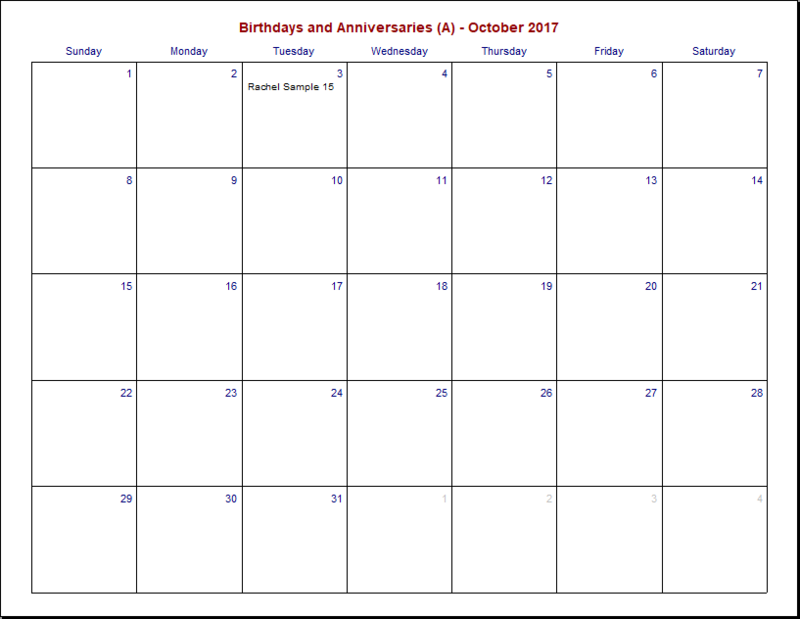 Click 'Calendar' to display the Birthday and Anniversary Calendar, click 'Printable Calendar' to display the Printable Birthday and Anniversary Calendar, click 'Printable Report' to display the Birthdays and Anniversaries printable report, or click 'Label' to print a label for the selected name. Click on an email address to start an email. Select 'Options' from the Tools Menu to set program defaults. Screen Colors - Click 'Background Color', 'Window Color', 'Highlight Text Color', and 'Regular Text Color' to set the screen colors for the program. Click 'Reset' to select the original EZ screen colors. Reports - Click 'Title Color', 'Heading Color', or 'Detail Color' to set the colors for all reports. Select 50 to 150 for the Default Zoom when a report is first displayed. Check whether to 'Show Date' and 'Show Page Number' on the bottom of reports. Renamable Fields - Phone, Cell Phone, Work Phone, Work Place, and the Christmas Option can be renamed. Leave a field blank to use the default. You can also select whether to Show the Christmas Option throughout the program. The Christmas Option can be used to Search the Address Book and then print Christmas Labels for those names. Click 'Format ALL Numbers Now' to change the format for all phone numbers in the EZ Address Book using the selected Auto Format. Labels and Envelopes - Check if you want to CAPITALIZE the Name and/or Address on labels and envelopes. Everywhere else in the program the name and address will appear as how it was entered. Check if you want to IGNORE the "Use First and Last Name for Sorting Only" checkbox on the Name and Address Entry Screen. Birthday/Anniversary Reminder Day Range - Enter a 'Day Range' for the program to use on startup. If any birthdays or anniversaries are within the range when the program starts, the Birthday and Anniversary Reminders Screen will be displayed. Enter 0 to not show reminders on startup. Consider adding EZ Home and Office to your Windows Startup folder so when you start your computer, EZ will start and show the Birthday and Anniversary Reminders. See Windows Help on how to add a program to the Startup folder. 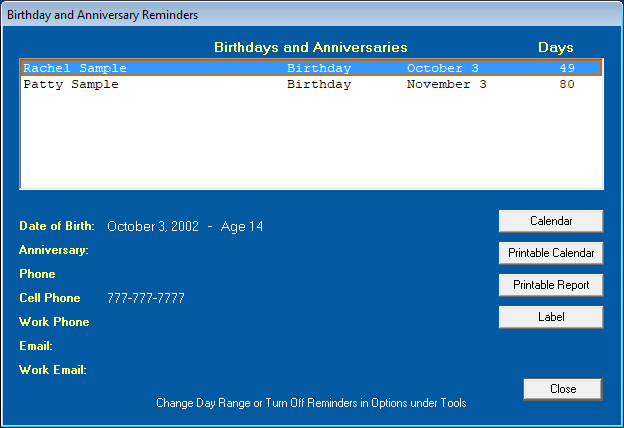 Birthday and Anniversary Reminders - Check or uncheck to set the default value on the Add Name Screen. Email Format Checking on Entry Screen - Check if you want EZ to perform basic email format checking on the Name and Address Entry Screen and when adding emails on the Email Lists Screen. For example, looking for invalid characters like spaces or the absence of "@". Check for Duplicate Names on Entry Screen - Check if you want to be warned when a name being added or changed already exists in the EZ Address Book. Sort by First Name or Last Name - Select whether to sort by First Name or Last Name throughout the program. Default Category on Start Up - Select 'ALL CATEGORIES' or a specific category to be displayed on the EZ Address Book Screen when the program starts. Default Country - Select the default country to use when adding a name. The Default Country does not appear in an address throughout the program including on labels. Select Countries from the Tools Menu or click 'Add Country' on the Name and Address Entry Screen to add more countries. Phone Number Priority for Labels - Set the priority for selecting a phone number to be displayed on labels if you checked 'Show Phone Number' on the Customize Labels and Envelopes Screen. Only one phone number can be displayed on a label. If a name has more than one phone number, the priority selected here will determine the number displayed. Currency - Select 'Dollars', 'British Pounds', 'Euros', or 'No Currency' to be displayed for Budgets. Choose 'Select Features' from the Tools Menu to select the features to show on the Features Menu and toolbar. Removing unwanted features can simplify the program. Removed features can always be added back later without the loss of data. Press F1 on any screen in the program for screen specific help (Fn + F1 on some keyboards). Select Frequently Asked Questions from the Help Menu for answers to many of your questions. For more insight into the program including how to print labels, run the Demos on our website at www.ElwoodSoftware.com. Other Names: Add each person in the family. For proper sorting check 'Use First and Last Name for Sorting Only' so "Mr. and Mrs. Bob Smith" will NOT be sorted by M ("Mr.") throughout the program. 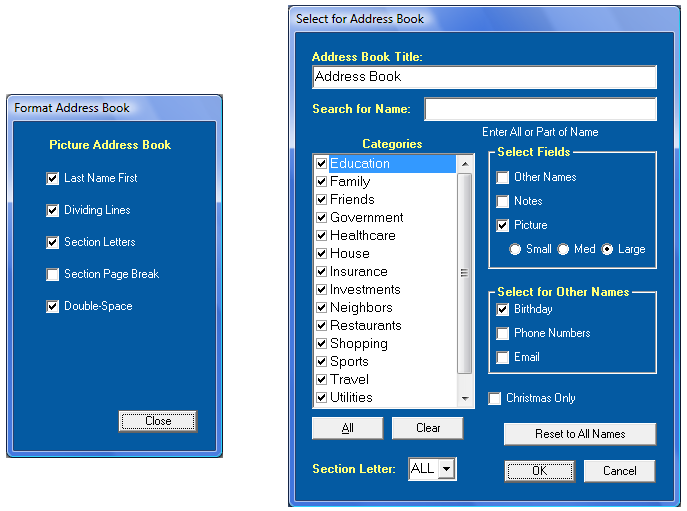 The First Name and Last Name will NOT appear in the Printable Address Book, Phone Book, or on labels. The Group Name can also be used for a business, organization, or other group. BACK UP YOUR DATABASE OFTEN by selecting Back Up Database from the File Menu or pressing F5. Backing up to a flash drive and restoring from a flash drive is easy. Check out www.DropBox.com for free offsite backup. If you have more than one database, each one must be backed up separately. Should you experience a hard drive crash, that backup will be very valuable to you. BACK UP YOUR DATABASE! 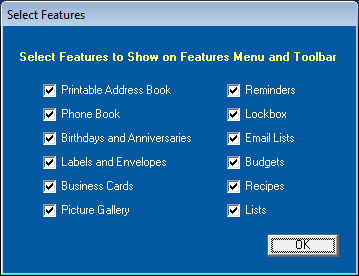 Select Options from the Tools Menu to choose the screen and report colors, sort order (first or last name), startup category, default country, phone number format, birthday/anniversary reminder day range, name formatting options for labels, and other important program defaults. You can also rename the Phone, Cell Phone, Work Phone, and Work Place fields in Options. Check out your options! On the EZ Address Book screen place your cursor over the displayed name on the right side to show the date it was added or last updated. Click the "+" or "-" button at the top right to change the height. Enter one or more letters in the Find text box to quickly find a name in the address book or use the search function. If reminders have been added, click on an underlined date on the calendar to display them. Select Open Database from the File Menu to add a database. You could use one for home and one for business. Each database must be backed up separately. Databases cannot be merged so consider using categories instead of multiple databases. Each database must be backed up separately. Select Delete Database Records from the Tools Menu to delete the sample data in the program. Consider adding EZ Home and Office to your Startup Folder to take advantage of the program's reminders functions when you start your computer. See Windows Help for how to do it. EZ Home and Office comes with an unconditional 60 Day Money-Back Guarantee. To move EZ to another computer or to keep computers in sync, EZ must be installed on both computers. Use the Back Up Database function (not the Export function) on the EZ File Menu of Computer1 to copy the database to a Flash Drive. Then use the Restore Database function (not the Import Function) on the EZ File Menu of Computer2 to copy the database from the Flash Drive. ALL INFORMATION will be REPLACED (not merged) on Computer2. DATABASES MUST HAVE THE SAME NAME so you might need to add an empty database on Computer2 before restoring. If you have more than one database, each one must be backed up separately and restored separately. You could install Dropbox (FREE at www.Dropbox.com) on both computers and then you wouldn't need a Flash Drive plus you would have offsite backup. Instead of using the Restore Database function you could manually move the database from and to c:\Elwood Software\EZ Home and Office\Data. EZHO.mdb is the database that comes with EZ and cannot be renamed. Any number of other Databases can be added (*.mdb). The database can only be opened by EZ because the database is proprietary and password protected. Pictures must be moved separately. Select Back Up Pictures on the EZ File Menu and back up to a Flash Drive. Then manually move or copy those pictures to c:\Elwood Software\EZ Home and Office\Pictures on Computer2. Email Lists, Graphics, and Recipe Pictures must also be moved manually. Each have their own folders under c:\Elwood Software\EZ Home and Office. Select Labels and Envelopes from the Features Menu. Click the Return Address button and add or select a return address. Click the Duplicate button for the number of labels you need. Click Continue to Preview Screen and select either 8167 or 8195 return address labels. On the Labels Preview Screen you can also add a return address to the 8163/8164 labels and on envelopes by clicking the Custom button. Click the Duplicate button to duplicate the label in the first position. Click the Skip button to skip used label positions on the labels sheet. Click Export Report from the File Menu to export any printable report. There are many export formats including the Adobe Acrobat Format (PDF). We recommend the PDF format. If you install Dropbox on your computers and smart devices (iPhone, iPad, NOOK, etc. ), you could export a PDF report file to your Dropbox folder and the report will immediately be available to your other computers and smart devices. Dropbox is easy to use and it's FREE. You can find more information about Dropbox at www.Dropbox.com. 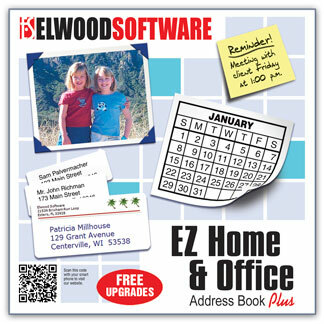 Email us at Support@ElwoodSoftware.com with your EZ Home and Office Address Book questions and concerns. Many of the changes to the program are made from customer suggestions so feel free to contact us. If you prefer phone support, email a phone number, subject, and time to call. EZ Runs on Windows 10, 8, 7, Vista, and XP (32 and 64 bit systems). When you see a newer version on this website, email us and we'll email you a FREE Download Link.